Lee Chapman, a British citizen, created on 18 January 2016 an online petition aimed ‘to recognize Taiwan as a country.’ Chapman argues that “national identity is a personal freedom and people should not be prevented from expressing that freedom.” He further explains that Taiwan meets the conditions of statehood and thus should be granted such status. The petition has obtained over 20,000 signatures. According to British law, a petition that garners at least 10,000 signatures will be considered for debate in the British Parliament. 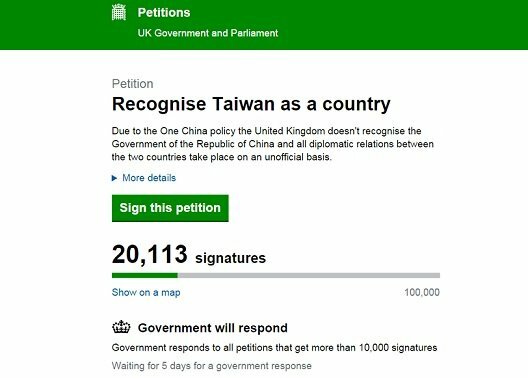 An online petition to "Recognise Taiwan as a country," which was launched on Jan. 18 by British citizen Lee Chapman, had obtained more than 18,000 signatures as of Friday. According to Casper Media, Chapman has traveled to Taiwan twice and is married to a Taiwanese woman. He told the online publication that the reasons for starting the petition is because of the recently concluded presidential election in Taiwan, which has placed it conspicuously on the world stage, and because of the treatment of 16-year-old pop star Chou Tzu-yu, who apologized after waving the Republic of China's national flag on South Korean TV. National identity is a personal freedom and people should not be prevented from expressing that freedom, he argued. "I believe that the United Kingdom should recognise Taiwan as a country. It fulfills all the criteria of being a country, it has been an independent country since 1912, it has its own democratic government, has its own currency, the list is endless," he told Casper Media. The petition, posted on the U.K. Government and Parliament website, said that due to the one-China policy, the U.K. does not recognize the government of the Republic of China and that all relations between the two countries take place on an unofficial basis. "It's time to change this. Taiwan is an independent country," yet China states that Taiwan is just another part of China, and most countries in the world do not recognize Taiwan because they do not want to upset China," the petition states. "Taiwan maintains the Taipei Representative Office in the U.K. in London with a branch office in Edinburgh, while the United Kingdom maintains the British Office Taipei in Taipei," it reads. "This is ridiculous and must change." The U.K. government promises to respond to all petitions that garner at least 10,000 signatures. With 100,000 signatures, a petition will be considered for debate in Parliament, according to British law.